Cody Borchers makes a catch on a pop up at third. Alex Joynes delivers a pitch. 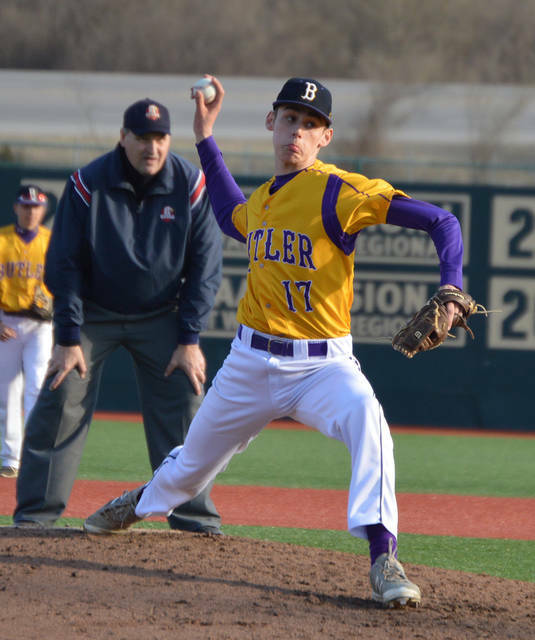 Quinton Hall got the start for the Aviators versus Centerville. Preston Tofstad makes a throw to first. Dolen Fults makes a leaping catch and saving a base as an Elk steals second. 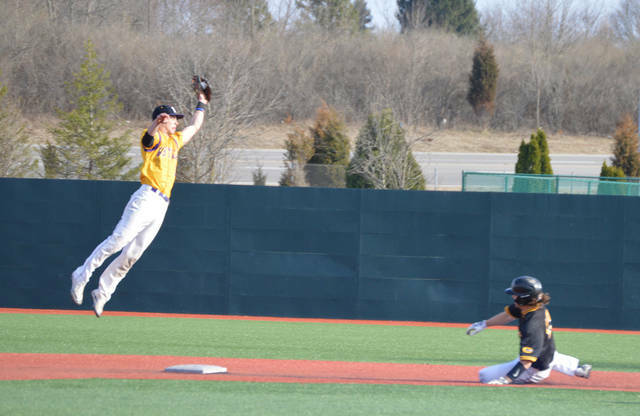 FAIRBORN – The Aviators saw their modest five-game win streak snapped Wednesday evening, dropping a 6-3 decision to Centerville at Wright State’s Nischwitz Stadium. After jumping out to a quick 3-0 lead, Centerville junior pitcher Connor Walch settled in and kept the Aviators in check for the next six innings. 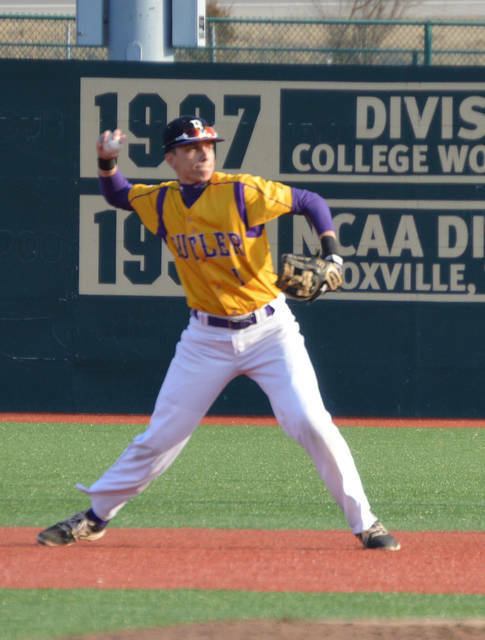 Freshman Boston Smith led the way for Butler offensively going 2-for-4 with a triple an a run scored. Junior Cody Borchers and senior Jake DeMoss each added an RBI for the Aviators. 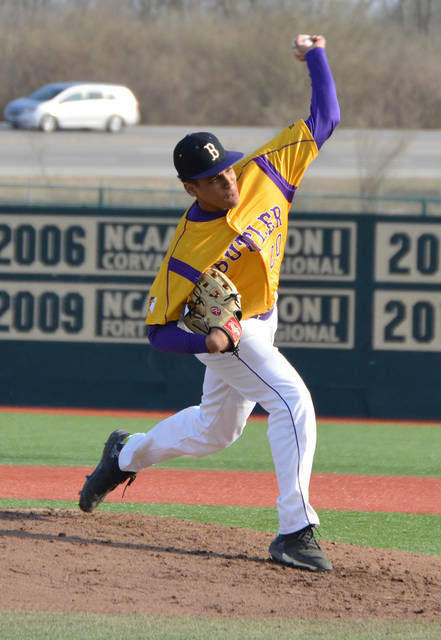 Freshman pitcher Quinton Hall pitched three innings, allowing just two earned runs. Senior Alex Joynes came on in relief to pitch the final three innings, allowing just two hits and one earned run. 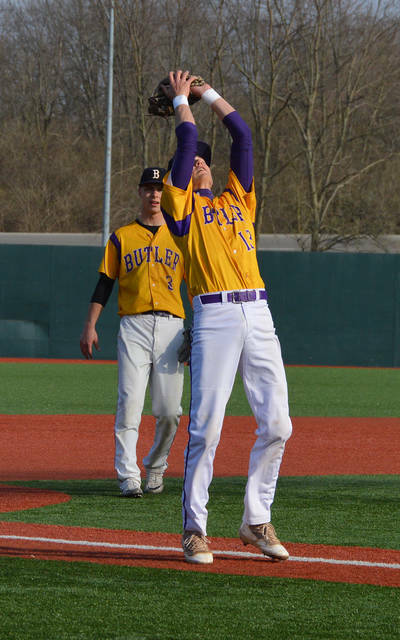 Butler (7-4, 4-0) returns to GWOC North action Thursday at home against Greenville at 5 p.m.